Alien Weaponry are one of the nominees for “Album Of The Year” at the Vodafone New Zealand Music Awards for their album Tū. I’m quite fond of this track; it’s in English and seems to be about someone struggling to cope with the effects of being made an outcast by their peers. It’s also quite remarkable that three kids who are still at school have just played a whole bunch of metal festivals in Europe. Their guitar work’s great and their vocal harmonies are superb. I didn’t realise they were still at school. That’s pretty damn cool. Best music phenomenon to come out of Aotearoa New Zealand in years I reckon … Te Reo Heavy Metal … These guys are ON TO IT! Cute scene. There’s a coolish northerwester but it’s sunny down in the stream and in my back yard & I see Ivan & Ludmilla are snuggled down having a wee sleep in the sun. There’s something very peaceful about the way ducks do that. The wai in the stream was so clear late this morning that at times, and the light so good, that where it was completely calm and there were briefly no ripples or wavelets on the surface, Ella sometimes seemed to be swimming around suspended in air. And, when I got really up close to her face, today was the first time I ever noticed that in addition to her blue eyes, she also has two pale, and distinctly blue, dots on her snout above both her protruding nostrils. I always thought that those were feelers or whiskers. One does learn something new every day. I love her transparent wings. She’s a beautiful creature with great charm. There were some rosellas in the city today, also a single duck (whose husband is usually with her) looking resigned as she sat waiting. I have seen rosellas there before, but not so many. Ludmilla and Ivan basically took up residence in my backyard for all of today. They only made one brief visit to the stream. i told them they’d have to wait for breakfast. It was so dark they wouldn’t even be able to see any wheat grains. This poor ducky looked as if she was wishing that her old man would hurry up. I don’t know what those little spots on nga tuna are for – but I wouldn’t be surprised if they are sensors that pick up other eels’, fishes’ or animals’ weak electrical fields. 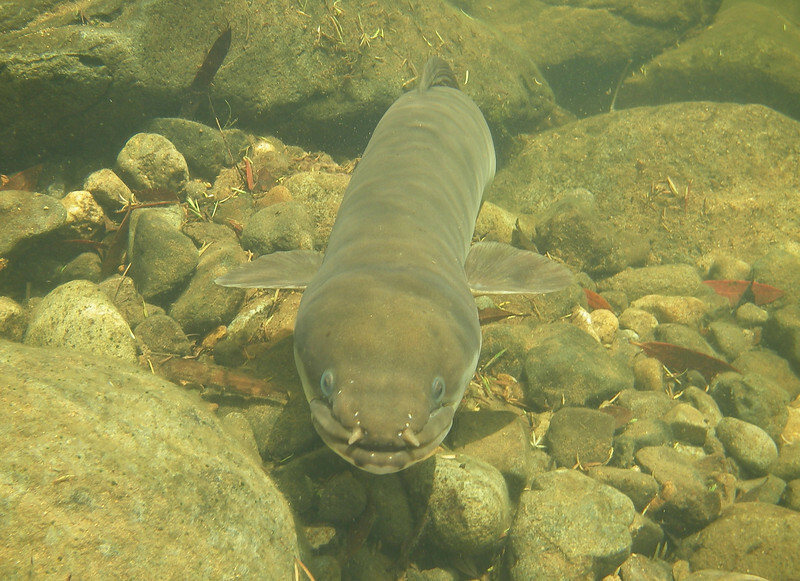 They may just be to make the eels look pretty and accentuate their lovely blue eyes. My fishy friends at 10.15 am this morning. Interesting. It’s another still, calm night, but last night’s overpoweringly strong joss-sticky scent that the over-the-fence pittosporum tree’s flowers are giving off tonight is barely noticeable. I had to walk up and actually sniff a flower to smell it. I wonder why it’s only some nights it powers up the scent like that? My guess is that possibly it pollinates by attracting a particular moth. There was a plus to the scent and flowers today too – today I was entertained on two separate occasions by a delightful pair of waxeyes, who were hopping about in it, sometimes hanging upside down, getting nectar from its densely packed, tiny purple flowers. Tried to video them but the leaves were too dense. Not usually into covers but this is pretty awesome … and very live!